The indomitable rhythmic insistence in Beethoven’s Symphony No. 7 brought the work a considerable number of pictorial descriptions with the object of explaining the mysteries contained within the persistent repetition of the first movement’s motif. In addition to famous pertinent phrases such as »an apotheosis of the dance« (Richard Wagner) and »victory of the symphony over the supreme power of rhythm« (Walter Riezler), such allegorical quips ranging from »ancient wine festival« to »march against France« were bandied about. Equally as rich as the wealth of quotes about this unique symphony is the number of its interpretations, which range from an orgiastic dash to plodding, meek or pussyfooted versions. As can be expected from Wojciech Rajski, the former kapellmeister of Bonn’s Beethovenhalle Orchestra, his stalwart Polish Chamber Philharmonic Orchestra delivers a lively, fresh and sinewy performance. 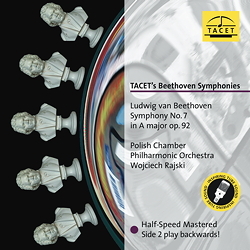 In accordance with the modus operandi of the company Tacet, audiophile tube technology was used for this recording thus guaranteeing sound reproduction of the highest quality. It goes without saying that tonal aesthetes and lovers of great symphonies will rush to get their copy of this disc without delay. Now halfspeed mastered and the B-side is playing backwards!